3 December 1951 19 July 1953 1 year, 229 days Military Selu had no power, real power laid in the hands of Adib Shishakli. 19 July 1953 25 February 1954 221 days Arab Liberation Movement Shishakli resigned from office because of threats of a coup in 1954. He fled the country, claiming that he did not want the country to fall into a civil war. 29 September 1961 20 November 1961 52 days Independent Kuzbari took office following the 1961 coup d'état, which dissolved the United Arab Republic. 17 September 1962 9 March 1963 173 days Independent The 1963 coup d'état, an event known as the 8th of March Revolution, toppled Khalid al-Azm and brought the National Council for the Revolutionary Command (NCRC) to government, although real power lay with the Ba'athist Military Committee, which organized the coup. (Syria Region) Salah al-Din al-Bitar was overthrown by the Military Committee because of his support for Michel Aflaq and the National Command of the Arab Socialist Ba'ath Party. 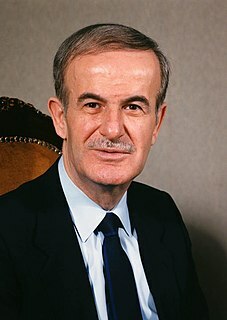 (Syria Region) Nureddin al-Atassi was overthrown when a falling out occurred between Salah Jadid, the real ruler of Syria from 1966 to 1970, and Hafez al-Assad, the Minister of Defense. Assad initiated the Corrective Movement in 1970. ^ Moubayed 2006, p. 85.